The Asian citrus psyllid is a sap-sucking, hemipteran bug in the family Psyllidae. The new v2.0 genome is online! Candidatus Liberibacter asiaticus psy62 is a gram-negative bacteria in the Rhizobiaceae family. It was published in 2009. The citrus greening disease (also called huanglongbing) has devastated the Florida citrus industry, and is now in CA and TX. Fruit from infected trees is safe to eat, but production is reduced so much that citrus may cease to be inexpensive and broadly available. If you are a citrus lover you should know that massive research efforts, including this project, are underway to keep citrus affordable and plentiful. See impact on US production..
Citrus Greening Solutions is a USDA NIFA project. Gene models in C. sinensis and C. clementina can now be curated in the Apollo annotation tool. Please request access using the contact form. You can find more information about resources on the C. sinensis and C. clementina genome pages. Citrus genomes are now available in the VIGS tool to design virus induced gene silencing experiments on C. sinensis and C. clementina. More details about the tool are available in the publication. Please report any issues using the contact form. Updated metabolic pathway databases for C. sinensis and C. clementina have been constructed with the latest version of BioCyc Pathway Tools and MetaCyc. This is a collaboration with the Main lab at WSU. The new PGDBs are C clementina Cyc v3, C sinensis Cyc v3 and C sinensis Cyc v4. Diaphorina citri stylet biogenesis paper is published! Asian citrus psyllid stylets and potato psyllid stylets are comparable in structure including the stylet end-caps of the adult and atria of the pharate adult. Apparent presence of epicuticle cells at the stylet base is not proven. Of interest, Liberibacter may possibly use the stylet replacement apparatus for transmission. Please see Arthropod Structure & Development. Volume 47, Issue 5, September 2018, Pages 542-551 for more details. Psyllids have a highly modified alimentary canal wherein the esophagus, anterior midgut, posterior midgut and hindgut are co-located and complexed into an apparently paraphyletic structure called the filter chamber. The animation is crafted to allow for broad scientific audiences to understand basic alimentary canal anatomy and functionality of the Asian citrus psyllid. The total economic impact of the iconic citrus industry is $7.117 billion according to a new study commissioned by the Citrus Research Board (CRB). You can read the full report here. Translation? 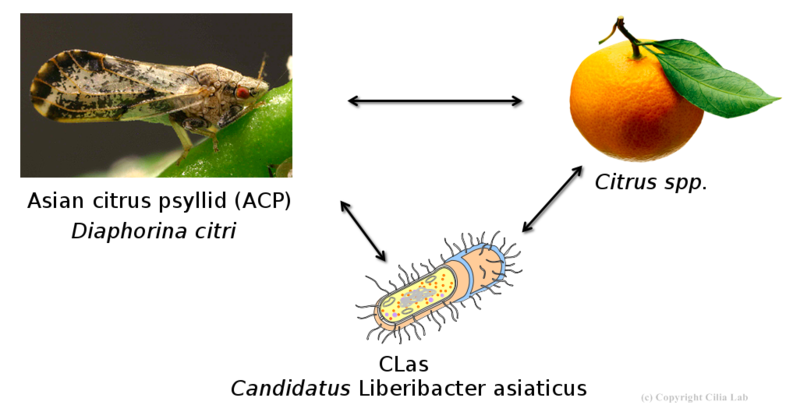 The gut cells of the Asian citrus psyllid nymphs do not respond the same way to infection by the Huanglongbing bacterial pathogen as adult guts. This was unexpected. C-Type Lectins(CTLs) are calcium dependent extracellular proteins involved in recognition of glycans. A total of 10 models were found and annotated. Refer to C-type lectin gene report for further details. The Basecamp page and FTP site contain the data sets and instructions for annotation. Relish-like proteins are transcription factors and are inlvolved in Imd pathway. The Basecamp page and FTP site contain the data sets and instructions for annotation. Galactoside-Binding Lectins (GALEs) or galectins bind to beta-galactoside sugars. GALEs are implicated in innate immunity as they might be involved in microbial recognition and/or phagocytosis. The Basecamp page and FTP site contain the data sets and instructions for annotation. Abstract submissions are now open for the Joint Conference of the International Organization of Citrus Virologists XXI (IOCV XXI) and the International Research Conference on Huanglongbing VI (IRCHLB VI) to be held in Riverside, CA from March 10-15, 2019. The Third Annual CitrusGreening Solutions meeting will be held on Dec 10-12th,2017 at University of California, Davis campus in CA. The IRCHLB V meeting was held in Orlando, FL from March 15-17th, 2017. See here for more information. The Cilia, Mueller and Shatters labs were represented at the meeting.